Text: Aulia R. Sungkar. Images: Courtesy of Sampoerna Schools System. Dr. Marshall Schott is taking his leadership role to scale Sampoerna Schools System to greater heights. 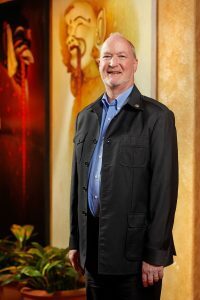 With over 18 years of experience under his belt, Dr. Marshall Schott was recruited by Sampoerna to lend its expertise in helping make Sampoerna Schools System a comprehensive education institution which fully complies with Indonesian law and regulations whilst maintaining a higher international standard. The Chief Academic Officer and Deputy COO of Sampoerna Schools System has only been here for two and a half years, but he is very confident that his blue sky thinking will contribute to the advancement of the system. “About three years ago, I was approached by Richard Carpenter who was the former COO of Sampoerna Schools System. The idea of building a comprehensive international education system that brought me onboard,” Dr. Schott recalls. Under the auspices of the Putera Sampoerna Foundation, Sampoerna Schools System is applied to programs at Sampoerna Academy and Sampoerna University. While the former caters students from pre-kindergarten to high school, the latter is a world-class tertiary institution known for its high-quality international education, especially with its faculties of Engineering and Technology, Business, and Education. The university also offers students the opportunity to earn globally-recognized degree from higher education institutions in the US, such as Broward College in Florida and the University of Arizona, Tucson. Dr. Schott believes that it would be better to in-source American education and develop an international-standard school system in Indonesia, rather than sending some of the country’s brightest to the US to pursue their academic goals. “Here, in Indonesia, we can build a strong American partnership, and educate hundreds of thousands of students, and make progress that way,” he asserts. He also highlights the challenge arising from the high price of international-standard education in Indonesia, and he says Putera Sampoerna Foundation has the willingness to do something about this issue of inequality. “In my mind, it is unfair that only the very wealthy have access to the best education. So, the goal is to expand access for the middle class segment in the country, which is currently growing rapidly,” he adds.